Fire company president Mark Fritz signs contracts Monday night as Glick sales representative Jake Bachman looks on. 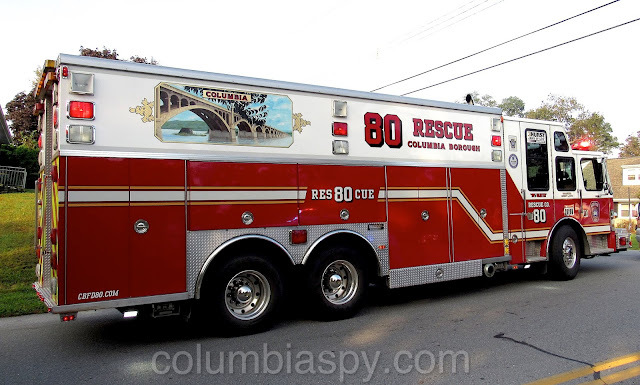 The Columbia Borough Fire Department will be getting two new trucks - a rescue engine and a fire suppression engine - by next summer at a cost of $1.3 million. The department deemed the purchase necessary since its current trucks are aging and becoming increasingly costly to maintain. 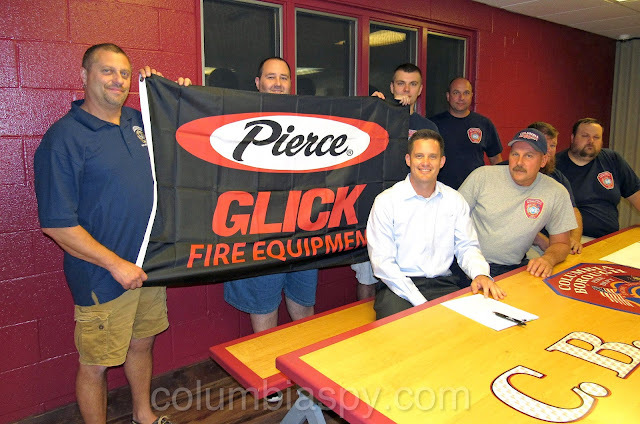 Fire Company President Mark Fritz signed contracts for the new vehicles Monday night. 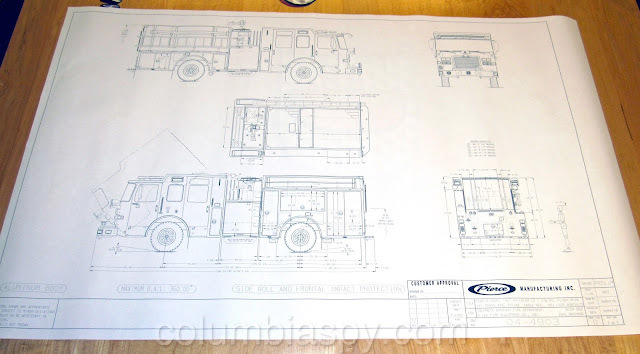 The final designs for the two new engines were presented by Glick sales representative Jake Bachman at the fire company building on Manor Street. 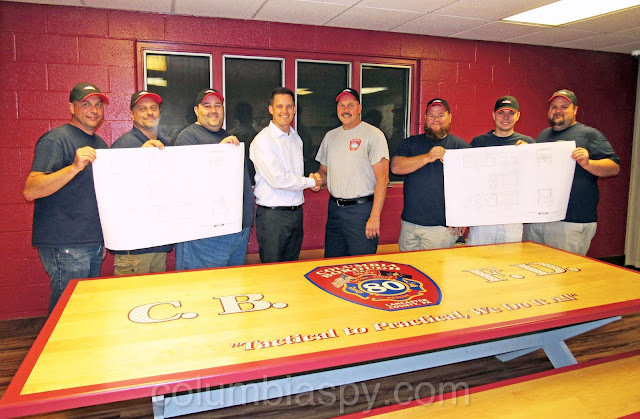 Firefighters gathered around a large table to view the designs and look on as Fritz signed the contracts. 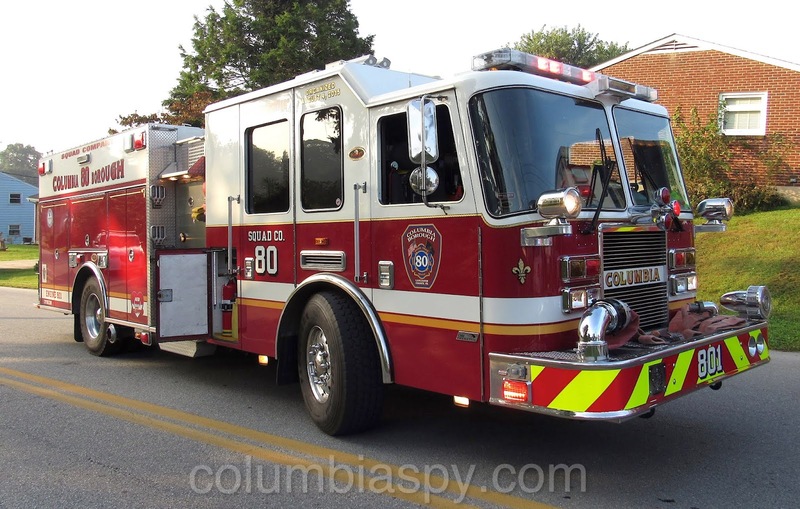 The department received significant discounts by purchasing two engines at the same time. The rescue engine will cost $715,378, and the fire suppression engine is $594,229. The prices represent a combined savings of over $60,000. 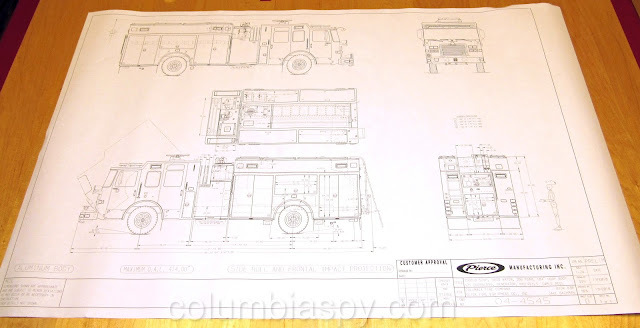 Pierce Manufacturing, Inc. will manufacture the trucks. The new vehicles are expected to arrive in about eight months and will be driven the roughly 800 miles from the Pierce plant in Wisconsin to Pennsylvania. Upon delivery, the department will place three current pieces of equipment up for sale - two engines and a rescue truck. Jake Bachman and Mark Fritz shake hands as firefighters hold drawings of the new fire trucks (shown below). Firefighters hold a banner featuring the Pierce and Glick company logos. Glick Fire Equipment Company, Inc. is a Pierce dealer. The units shown above are two of the three vehicles that will be up for sale when the new trucks arrive.